If horror is your favourite genre, don’t miss these four fear-inducing reads! Welcome to my interview with Catherine Cavendish – author of Gothic, ghostly and historical horror! I can’t actually remember a time when I didn’t write. Certainly since I could hold a pencil in my chubby little girl hand. I was a precociously early reader and my love of stories led me to want to create my own. As an only child, I invented characters to inhabit my world. CREATURE by Hunter Shea. I love all his books but with this one, he has surpassed himself. It’s a horror novel but it works on so many different levels and over-riding everything is a story of a woman’s struggle with a terrifying auto-immune disease. This one comes from the author’s heart and soul. Incredible work. For me, his best yet. I’m nuts about horror, and I’ve read and reviewed your book ‘Miss Abigail’s Room’ which I really enjoyed. Oh thank you! That’s very encouraging to know! That’s a hard one to narrow down. I always love what I am working on at the moment because if I didn’t, what would be the point in continuing with it? But I do have a really soft spot for my latest novel – Damned by the Ancients. It’s the third in my Nemesis of the Gods trilogy and is mostly set in my favourite city – Vienna. My villain – Dr Emeryk Quintillus – is particularly evil in it and there is a starring role for a beautiful black cat, although she is far more than what she seems. I am at the planning stage for a novella set in a hospital where a woman is recovering from a life-changing operation. There are forces within the hospital though. Things that shouldn’t be there. Things long dead. That really depends on my mood and on the time of the year but in spring and summer, you can’t beat the countryside – and I would include forests in that, especially on a really hot day when you can shelter among the shady pine trees. What’s the best vacation you’ve ever had? Every time I’ve been to Vienna – and I have visited there a lot over the years. It has so much culture and history, the architecture is stunning but it is also a surprising city. Down narrow streets, all manner of curiosities are waiting to be found. It is such an easy place to get around, with excellent, straightforward and remarkably cheap public transport and, of course, the best coffee in the world. Murder by Death. It’s absolutely hilarious – a spoof on a host of fictional sleuths from Hercule Poirot to the Thin Man and with an all-star cast including Peter Sellers, David Niven, Maggie Smith, Elsa Lanchester and Alec Guinness. It was written by Neil Simon so, need I say more? It’s my favourite feel-good movie. This changes from season to season in many instances but currently, it’s Killing Eve – a tightly woven psychological drama series that has really got into my head. I am also enjoying American Horror Story: Apocalypse – which I think is one of the best in this franchise. Sarah Paulson and Kathy Bates are superb. Name three people you admire and give your reasons. Barack Obama – in my opinion, a true statesman who remained dignified and collected no matter what was thrown at him while he was President and continues to do so. Nelson Mandela – his courage and dignity are a constant source of hope and inspiration even though he is no longer with us. Princess Diana – she broke through taboos and gave a voice to people who had none. She wasn’t afraid to speak out on unpopular issues and embrace – literally – people others would cross the street to avoid. I think her sons bear true testimony to her legacy. What’s your favourite quote ever? My books are widely available so readers can choose their favourite store. Readers can visit my Catherine Cavendish website or find me on Facebook, Twitter or Goodreads. Thanks for being here with us today, Catherine! The identity of Jack the Ripper remains one of the biggest mysteries in the history of both Victorian England, and of the murky world of serial killers. Maniscalco takes that mystery, envelopes it in the life and times of a fictional would-be forensic scientist, shrouds it with London fog, and hides it in a dark place where nobody thinks or dares to look. 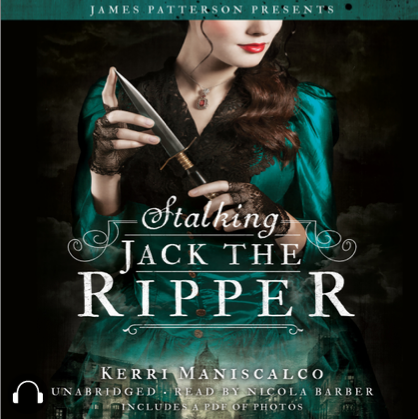 ‘Stalking Jack the Ripper’ is a beautifully written blend of mystery, macabre horror and historical fiction that keeps the audience completely rivered as the story unfolds. Suspense builds from the time of the discovery of the first victim right up to the climax and conclusion. Available on Kobo and Audible. The cast of characters is varied and complex, each with secrets and personal motivations that intrigue both the reader and one another. The way in which the author drops hints and suggestions is quite tantalising, adding another layer of mystery to the characters and their actions. I thoroughly enjoyed this audiobook. The narration was fluent and well paced, and a pleasure to listen to. I definitely plan to indulge in the sequel very soon. ‘Stalking Jack the Ripper’ has been awarded a Gold Acorn. Find your copy on Kobo or Audible. This is my favourite kind of story: history, magic, mystery, suspense, danger and choices that seem impossible to make. Superimposing a magical overlay onto real historical events made this book absolutely fascinating and gave it a very strong sense of originality and intrigue. The drama built slowly and steadily throughout each complication and challenge, drawing the reader deeper and more intricately into both Thomas’ life and challenges and the Gunpowder Plot itself. The main characters were well-rounded and likeable, even if it was not always possible to like or condone some of the things they felt compelled to do, and the problems they faced were well-designed and skilfully developed. The way in which the author breathed both life and magic into historical figures, events and places made them seem so real that the audience really does begin to feel as though they are there, looking over Thomas’ shoulder and equally as swept along by the action of the story as it unfolds as he is. Of course, part of the magic of this audiobook is the masterful narration by Oliver Hembrough, who excels at voice acting and storytelling. His performance combined with Brandes’ brilliant writing to create an audiobook that is flawless in its delivery of this deeply intriguing tale. This beautifully crafted story completely captivated me. ‘Fawkes’ has been awarded a Gold Acorn.